Brian Harris is a graphic artist who, as of late, has been moving increasingly into 3D work — thanks in large part to the ever-expanding technology of 3D Printing available at sites like Shapeways. 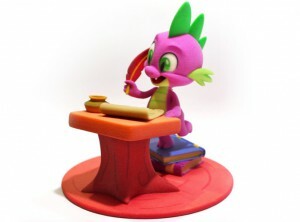 Working under the name Timothy BH, Brian has been selling sculptures of Goldie Pheasant from Rock-A-Doodle and Spike the dragon from My Little Pony: Friendship is Magic, as well as others… and he intends to start taking commissions soon. Check out his Shapeways Shop to see his current work and find out how to keep up with his latest creations.